Wes Anderson’s Moonrise Kingdom has shaped up to be one of the critical successes of the summer. With the film still rolling out in theaters and winning audiences and acclaim, the director explains how his latest hit went from script to storyboard to screen. 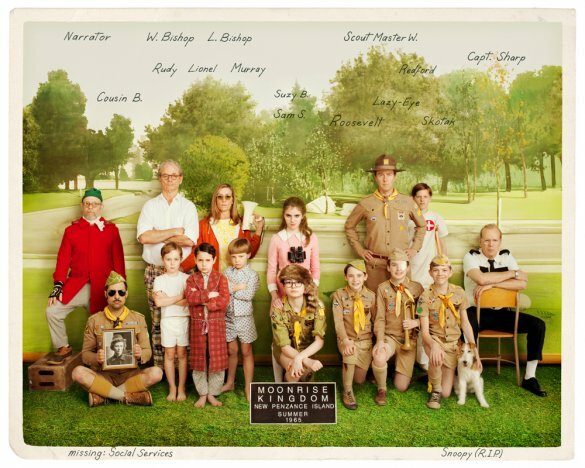 Wes Anderson’s latest movie, Moonrise Kingdom, which opened in many more cities last week, has earned the director some of the best reviews of his career and has been tearing up the specialty box office. The film was his first live-action feature since making the stop-motion animated Fantastic Mr. Fox and the influence of that experience is evident in the film’s meticulously detailed production design and its arch theatricality. Here, Anderson takes Co.Create through the process of putting together the pieces that comprise his masterful seventh feature. Then, of course, comes casting which, he says, leads right back to the script: “That is always about how we bring this scene to life for these people, to pretend it is really happening,” says Anderson, who co-wrote Moonrise Kingdom with Roman Coppola. Take for instance (spoiler alert!) the storm sequence towards the end of the film. “The storm arrives and there’s a lot of simultaneous action,” says Anderson. “There’s a lot of running around and it’s the kind of thing where you’ve got to make sure the audience is grasping [what’s happening] and understanding the spaces. And in some parts of the movie, we were filming in places [that don’t] really quite exist and we’re having to figure out how are we faking this so that you get an impression of something that makes sense. “The music comes into it in different places in the process,” says Anderson, who had some music in mind before he wrote a word. He also came upon more of it during the script writing, but some of the elements were not decided until the movie was being edited. Anderson decided to open the movie with dialogue and music from Britten’s The Young Person’s Guide to the Orchestra, as conducted by Leonard Bernstein for his Young People’s Concert series. It’s an apt framing device as it lays out the various components of an orchestration and demonstrates the layering that occurs, much like that which comprises Anderson’s detailed and meticulously crafted film. In the last two months, as Focus Features was preparing for the release of Moonrise Kingdom and Anderson was doing pre-release interviews, he was hard at work on his next screenplay. Now that it’s done, he’s deep in research and some initial casting. “I’m kind of figuring out how I’m going to go about making it,” Anderson says of the movie, whose title he won’t yet reveal, but which he says will be shot in Europe.